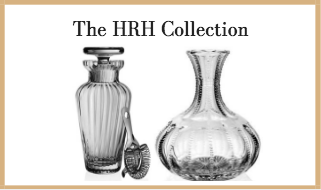 HRH’s inspired product range of luxury home furnishings and home interiors makes for statement pieces in your home, charming and unique gifts and enticing houseware collectibles. Glassware: highly styled decanters and claret jugs from the Art Deco period, gold gilt champagne coupes, delicate pastel Harlequin brandy glasses and refined sherry glasses. A unique compilation of cut-glass, crystal and etched tableware and dignified barware that no home should be without. Well, we can all aspire to the glamour of the legendary American Bar at the Savoy Hotel. Porcelain-ware: immaculate tea services, pretty milk jugs and embossed sugar bowl, striking cake stands, lidded preserve and butter dishes, charming cruet sets, elegant dinner service sets, chic tureens, serving bowls and platters, stand-out vases, with a superb mother of pearl collection. The perfect setting to celebrate the sense of occasion at a dinner party, banquet, ladies who lunch, Easter, Thanksgiving, or festive event. Silver-ware: if it’s the Downtown Abbey silverware that you’re searching for, then HRH carries a polished collection including Fois Gras serving tray, cheese scoop, cake servers, cake knives, fish knives, sugar scoops, Art Deco ‘Silver Lady’ candle holders and an array of photo frames. You don’t need to be a Lord and Lady of the manor or Duke and Duchess of a stately home to appreciate such fineries. Decorative/display pieces: one-off ornamental statues, ceramics and statement pieces from the Art Deco, Art Nouveau, Rococo, Regency and Victorian periods, in addition to candelabras, silk orchids, vintage perfume atomisers, compact mirrors, dressing table sets and rare vintage jewellery, making for an eclectic homewares collection and alluring aesthetic beauty. Soft furnishings: an extravagant deluxe cushion selection taking you through all the seasons from rich, opulent, lush fabrics, to soft, fresh, vibrant light-weight textures, across the full colour palette and a range of tasteful prints – an essential home accessory that will always keep you on trend. Wall-mounted: irreplaceable elaborately framed original art featuring objets d’art, prints and canvases, statement chandeliers and unique clocks – adorn your walls and evoke a sense of style and decadence. Coffee Table Books: HRH has hand-picked a library of published works for the discerning reader – the perfect attribute for every home’s Coffee Table. The scope extends across Royal Volumes, Fashion Doyennes, Haute Cuisine, Culinary and Baking Bibles, Travelogues and World Atlas, Contemporary Fiction and for the Wine Connoisseur – inspiration for your imagination.